No deer hunter likes weeds in a food plot, but they’re an inevitable part of planting and maintaining a field of clover or any other food-plot plant. So what can you do about weeds? The easiest choice is to do nothing. There’s no rule that says you have to clear the weeds from your food plots, but it makes perfect sense. Allow them to grow and they’ll overwhelm even the healthiest plot in a season or two and leave you with little more than a scattering of clover among the fescue, wiregrass and other undesirable plants that grow like, well, weeds. Such vegetative varmints rob your plots of nutrients, moisture and space, and they can turn your hard work into a pointless effort if you don’t control them. In other words, the only choice is to kill those weeds. 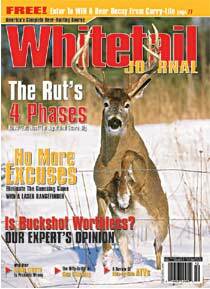 The good news is that controlling them is pretty easy, as long as you use the right equipment at the right time, says Whitetail Institute national sales manager Mark Trudeau. “The easiest solution is to use herbicides,” he notes. There are countless brands on the market, and the names alone can be as confusing as quantum physics, but Trudeau says there are really just three classes, or types, that are of importance to food-plot users. These include non-selective herbicides, such as Round Up, which kill all plant growth; herbicides that kill only grasses; and those that work on broadleaf plants. 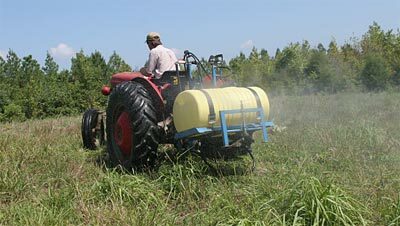 Grass-specific herbicides kill a variety of grasses such as fescue, wiregrass and Johnson grass, but they also kill beneficial grasses such as wheat and rye. Broadleaf herbicides, on the other hand, kill just about everything except grasses, while some, including Whitetail Institute’s Slay, kill a variety of broadleafs except clover and alfalfa. The best advice, of course, is to read the product’s label before you use it to make sure you’re employing the right tool for the job. Trudeau also recommends mowing some plants, especially clover, in the late spring and again in the fall. Mowing not only stimulates new growth, which can result in thicker stands of clover, but it will remove the tops of weeds, preventing most of them from forming seed heads. There’s nothing wrong with that, but be prepared to deal with a rash of new weeds when growing season kicks into high gear. If the food plot is new, it’s important to wait until the planted growth is 4 to 6 inches high before mowing or spraying is begun, even if the weed growth overtakes the plot plants, says Trudeau. When it reaches that height, the planting is strong enough to handle a dose of herbicide. Since some plants don’t start growing until mid- or even late spring, you’ll likely be faced with another rash of weed growth after that first herbicide application. Although some herbicides are residual, meaning they remain in the soil and work on plants that haven’t even started to grow yet, others, such as grass-specific herbicides, aren’t. You’ll need to reapply them a couple of times a year as new grasses sprout. When you spray or mow is just as important as what you use and how you use it, adds Trudeau. 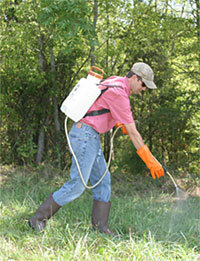 He says the best time to use any herbicide is in the spring, right after unwanted plants start growing again. That’s usually when daytime temperatures average around 60 degrees, but he notes that it’s important to examine plots to look for new growth. Trudeau also advises that it’s a bad idea to mow in the summer. Just as spraying herbicides can stress clover and other food-plot plants, cutting them during the extreme heat of July and August can also shock the plants. He notes that if weed growth is heavy and those weeds are showing signs of seeding, set the mower above the desirable plants and cut only the tops of the weeds. Ideally, however, wait until fall when rain and cooler weather gives all the plants a quick burst of new growth. “You can spray again or you can mow, but it has to be early enough in the fall that the plants are still growing. If you wait too long, the plants will be in their winter dormancy phase and herbicides won’t have much of an effect,” he notes. Doing something is certainly better than nothing. The war on weeds might seem like an endless fight, but it’s a fight worth winning, especially if you put so much effort into planting a food plot in the first place.